It feel it’s so important to use local businesses and help keep them alive. Rather than funding the fat cats at the top of a chain, you’re helping to support people just like you and their families. Each individual sale means something. You can also find gifts that are a lot more unusual when you shop with local businesses! In Kent and Medway we have an abundance of lovely small companies creating beautiful products that would make wonderful gifts. Here are my top picks of who to shop with in Kent this Christmas! 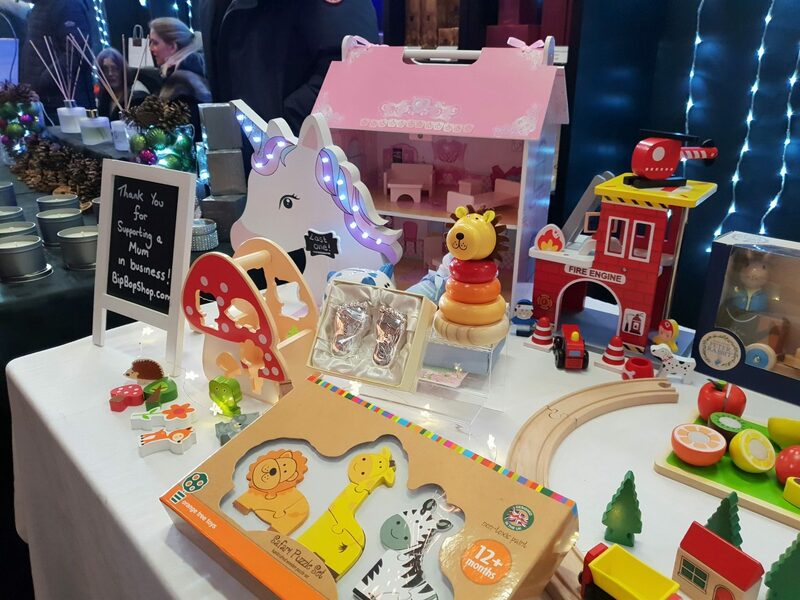 Kent based mumpreneur Charlotte runs the online baby and children’s gift shop, Bip Bop Shop. I recently had the pleasure of meeting her in person and seeing some of her lovely wares. 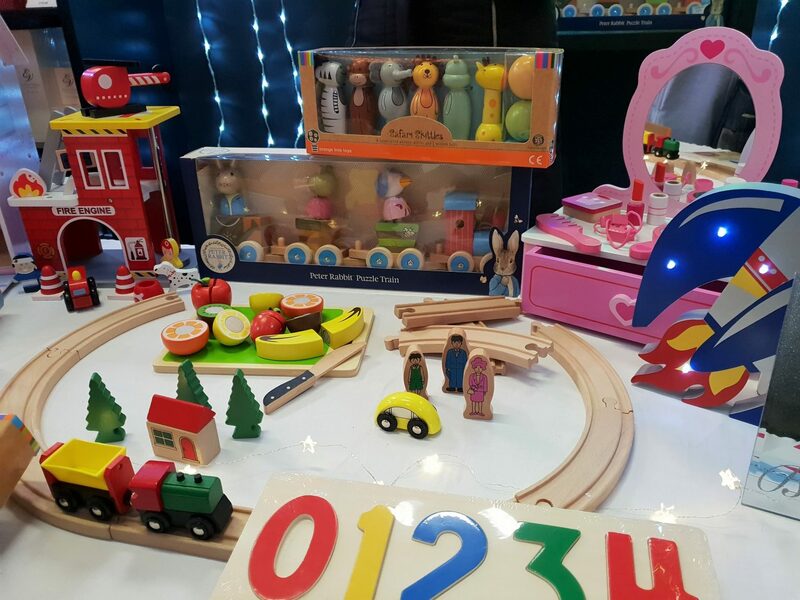 These wooden toys and gifts are gorgeous and look fantastic quality. Of course, one of the best things about wooden toys is that they can be passed down through siblings and generations. Unlike noisy plastic ones which will likely get broken and be discarded, they are a gift that will keep on giving for years to come! Mein Bellchen is another local business that I’ve been following for quite some time. 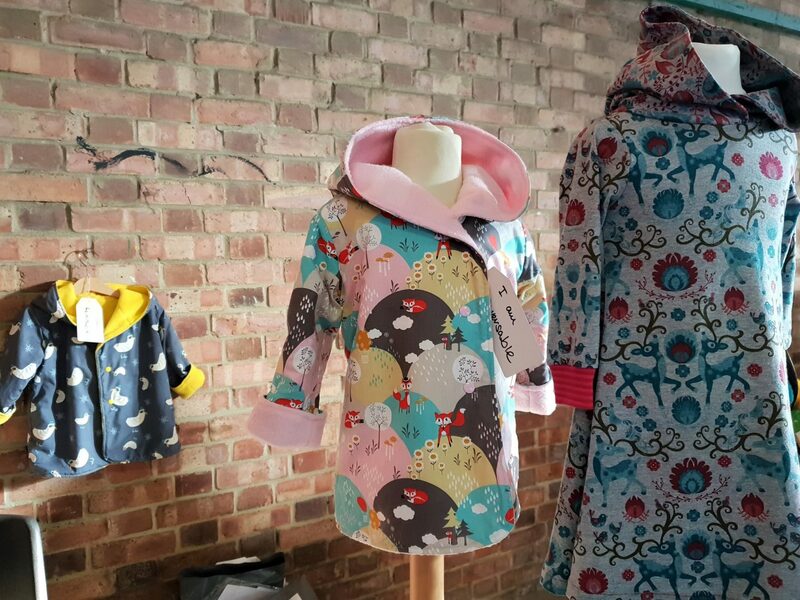 Based near me in Rochester, Izzy creates bright and beautiful clothes for 0-6 year olds. They look fantastic online, but just wait until you see them in real life! Photos don’t do them justice. A particular favourite of mine is the snowman dress on the far left, which would make a great gift. Unlike a lot of Christmas clothes which cannot really be worn other times of the year, it is reversible with a red and white polka dot pattern on the other side. Genius! Everything felt a really good quality and I was also very fond of the coats! 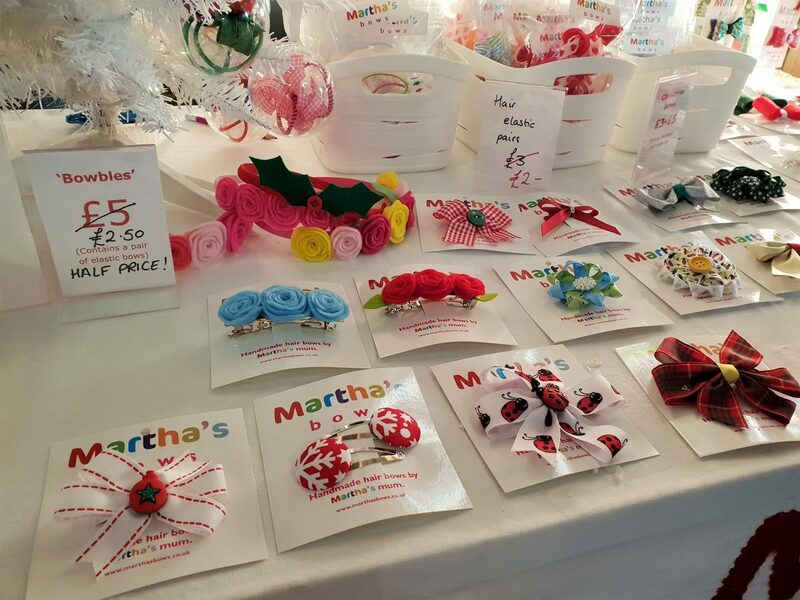 These beautiful hair bows and hairbands are from Martha’s Bows. There are so many bright and beautiful designs that will look great in your child’s hair and be a lovely stocking filler! 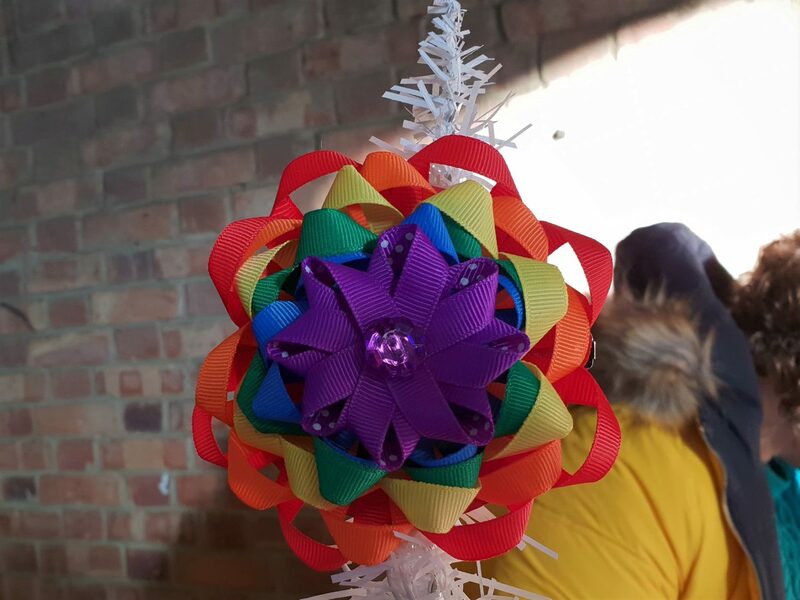 Check out the Facebook page and see the local markets you can find them at in Gravesend, Walderslade and Maidstone over the next couple of weeks. This beautiful rainbow was a particular favourite of mine! I bought a couple of clips for Autumn’s hair and they were beautifully gift wrapped, too. 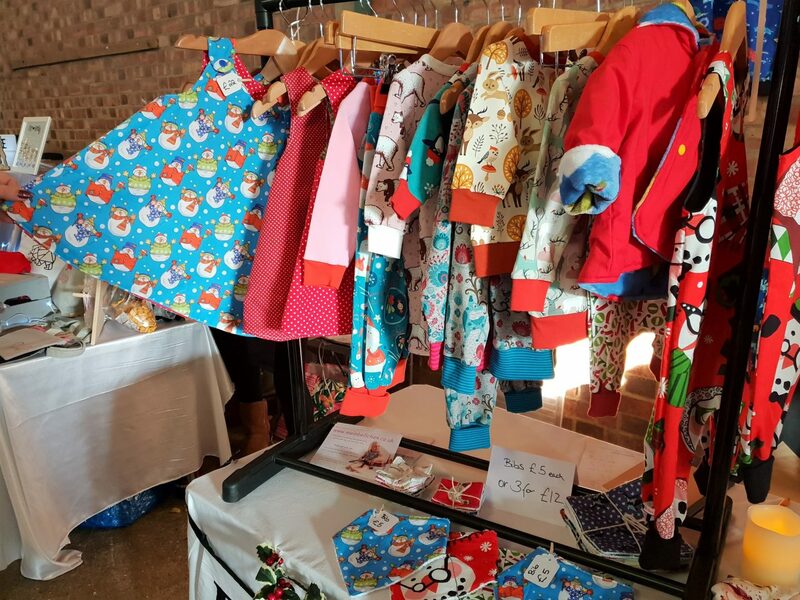 I found this lovely stall at the fantastic Broadditch Farm Christmas Market at the weekend, but unfortunately didn’t catch the name of the business! If you know, please do let me know so that I can update this blog post. The market is on again this weekend, so you should be able to catch them again. They had such a lovely range of cushions and peg bags of a lovely quality. We got Autumn a Peppa Pig one for her room, which she adores! All the businesses I mentioned so far were actually at Broadditch Farm Christmas Market and were my highlights of our visit there. It’s well worth going! 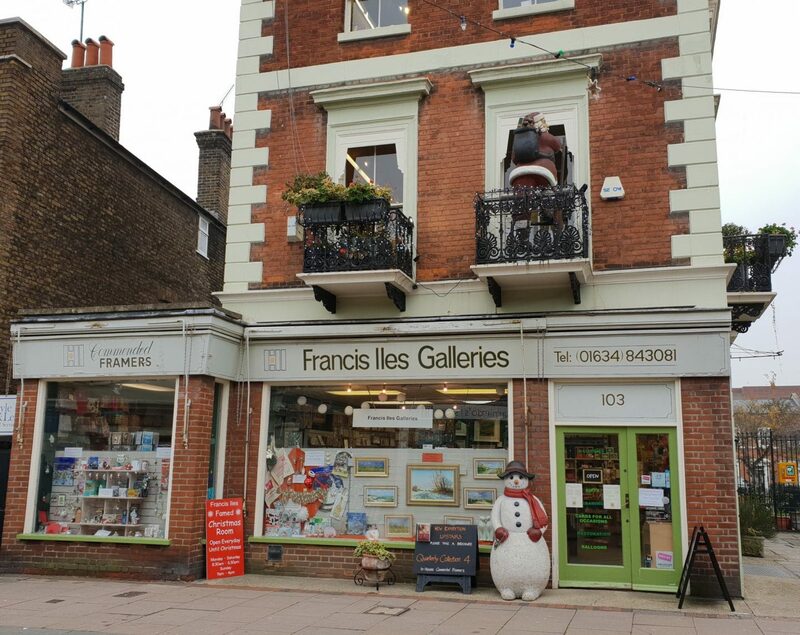 Francis Iles is one of my most favourite shops in Rochester High Street, for good reason. 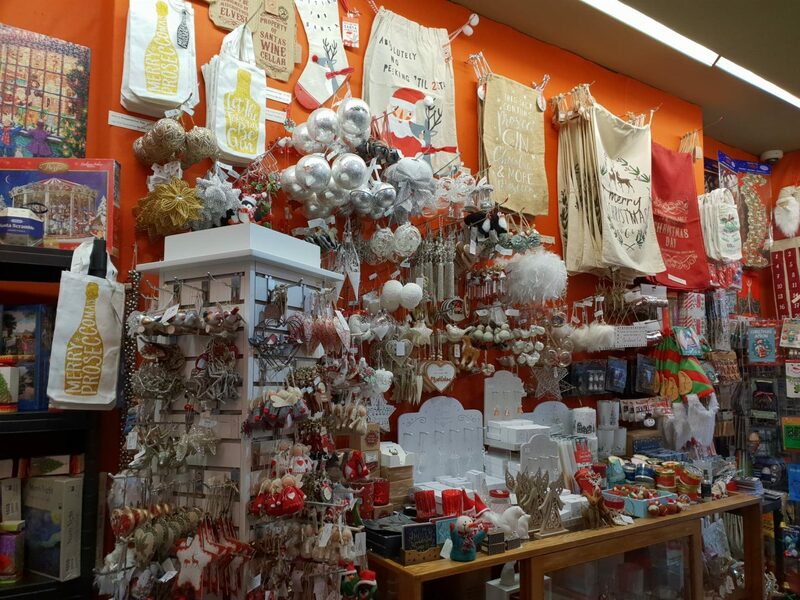 There are so many lovely gifts for sale all year round including cuddly toys, lunch bags, ornaments, cuddly toys, books, jewellery and more! However, at Christmas they go one step further as they have a Christmas room upstairs next to the gallery! 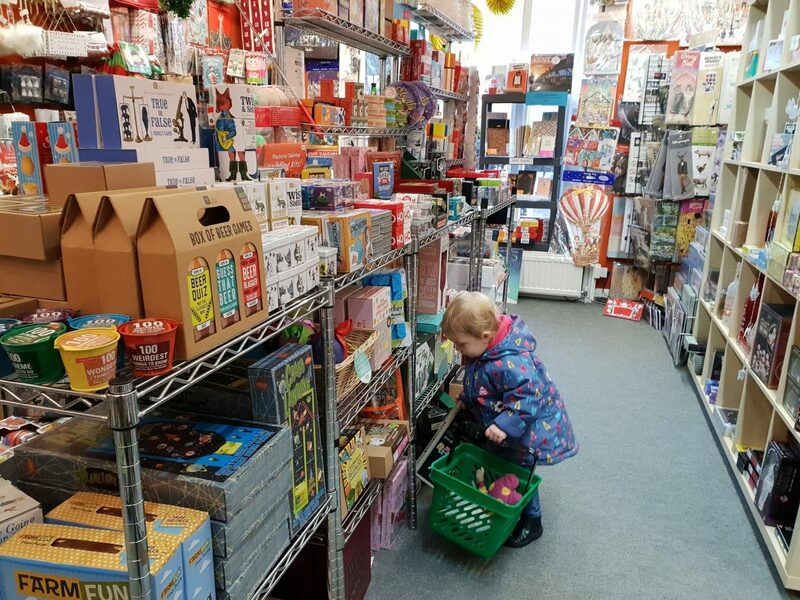 It really has to be seen to be believed and has such a wonderful selection of gifts, puzzles, games and decorations. 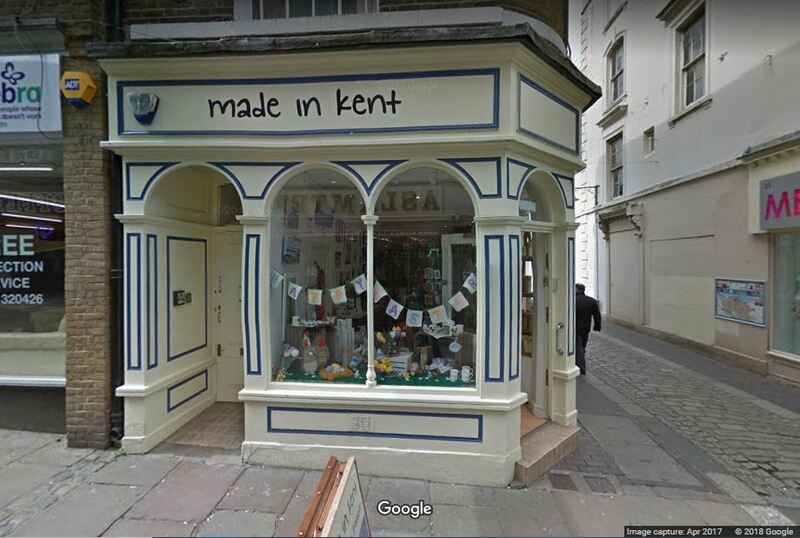 Made in Kent in Gravesend High Street is my joint favourite shop in Gravesend (along with Munns, which is also great for gifts and a two minute walk from Made in Kent). All of their profits go to North Kent Mind, a mental health charity. 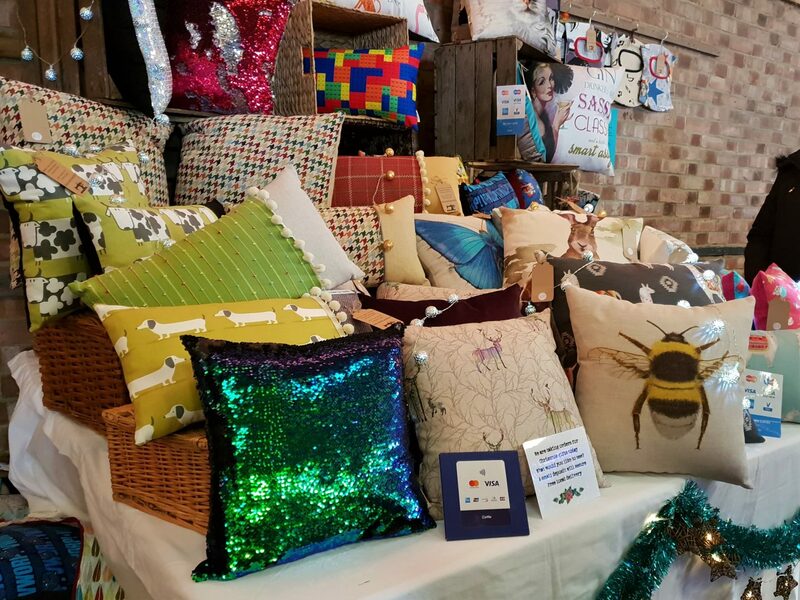 They sell art as well as all kinds of gifts ranging from earrings, baby booties, doorstops to cookie making sets and teddy bears created by artists and makers all over Kent! 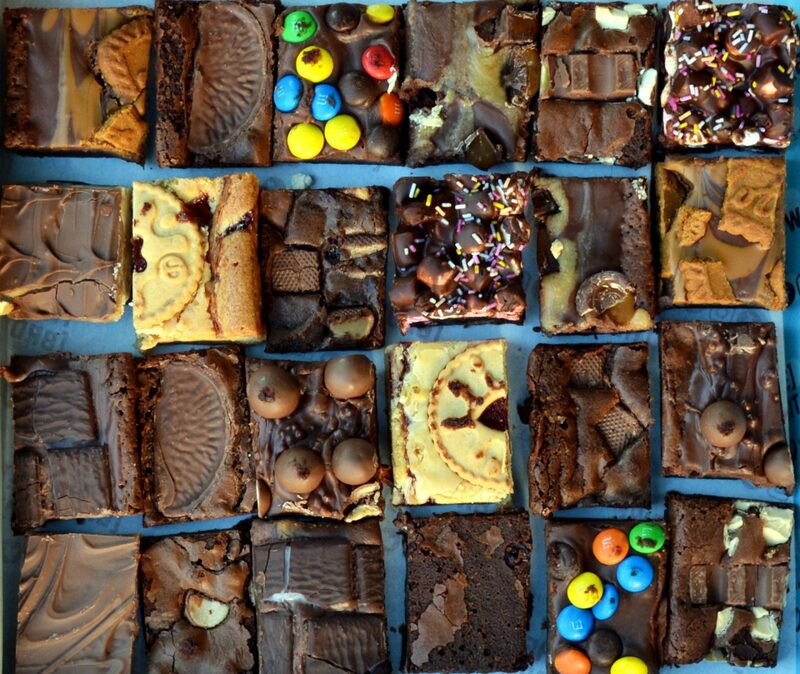 The Brownie Edit couldn’t be much more local to me, which is great as they make delicious brownies! Even better, hand delivery is free within 6 miles of them. If you’re a little further away, it’s only £2.50 to have them sent in a box that will fit through your letter box. 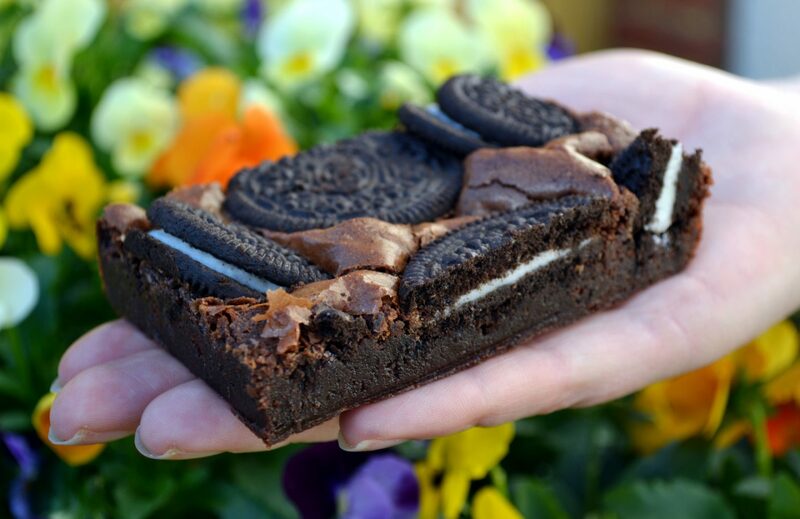 With so many flavours including Oreo, salted caramel and Jammie Dodger blondie, which will you choose to gift someone? 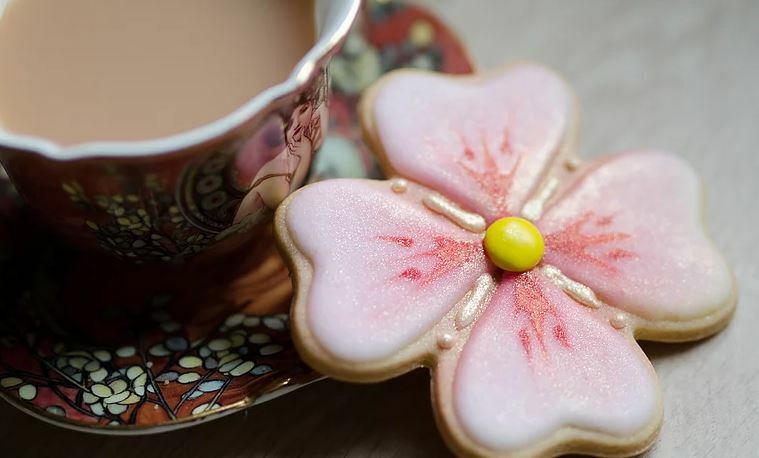 If biscuits are more your recipients thing, look no further than Biskilicious’ beautiful artisan biscuits. 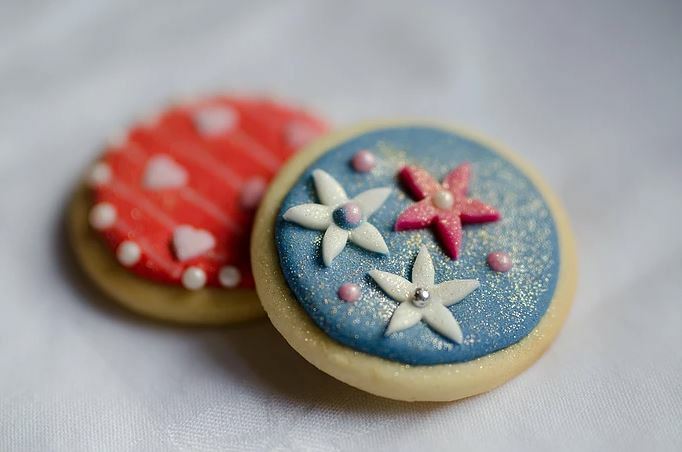 Hand iced and with free-from options, these biscuits are baked and beautifully packaged in the heart of Maidstone. 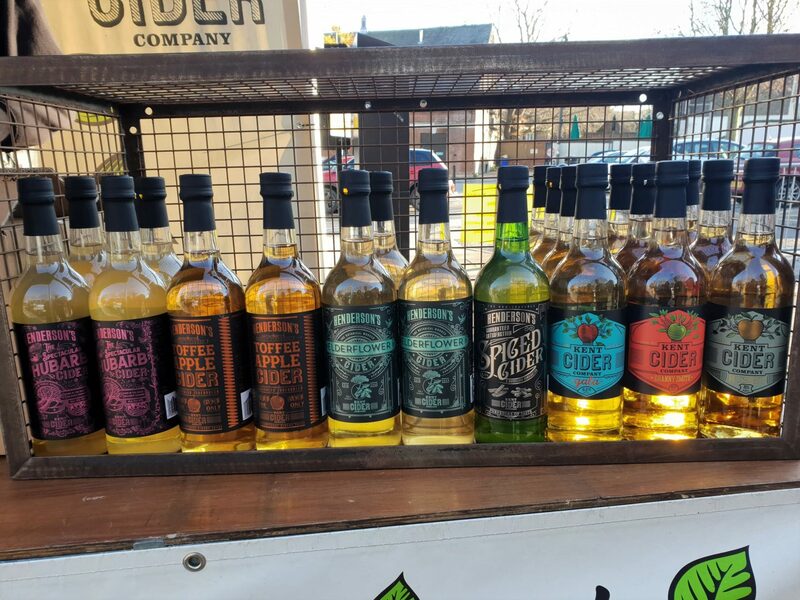 The fantastic Kent Cider Company make delicious craft cider using traditional methods. There is an array of flavours on offer for the cider lover in your life. I tried the elderflower flavour at the weekend, which in my exact words was “The oddest cider I’ve ever tasted, but in a good way”. Unfortunately, my phone pictures on a sunny day really don’t do Joanne’s Preserves justice! These wonderful chutneys and jams are made in Upchurch. I’ve tried quite a few of Joanne’s Preserves now and they’re always lovely. It’s always fun looking at the stall and selecting what to try next and which fabric top you’d like! 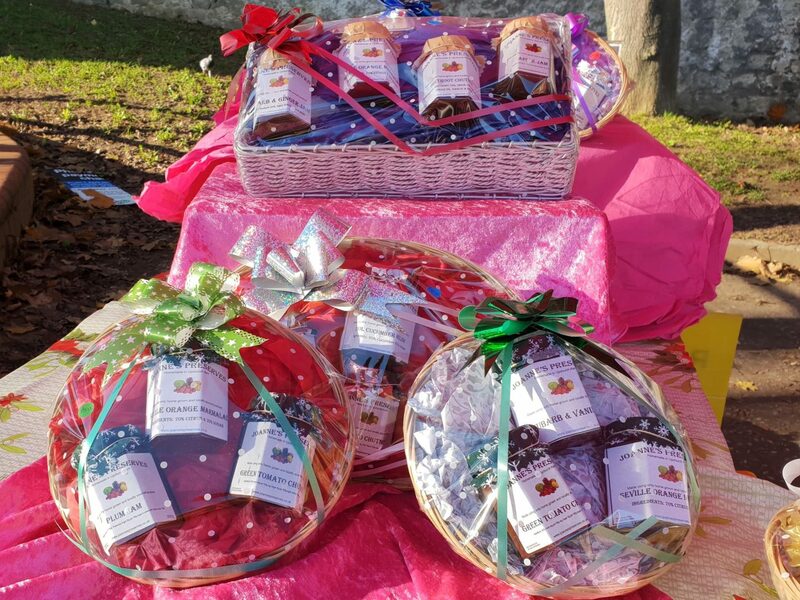 There are also beautiful ready made gift hampers containing jams and chutneys which are very reasonably priced! 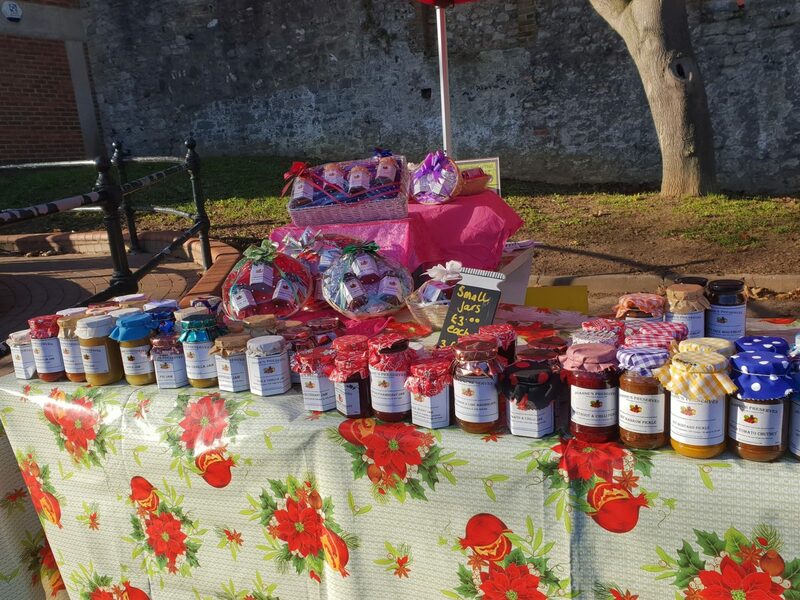 Joanne’s Preserves can be found at Rochester Farmer Weekend in Blue Boar Car Park on Sunday mornings. Otherwise, you can check Christmas markets you can find these lovely products at on the Facebook page. 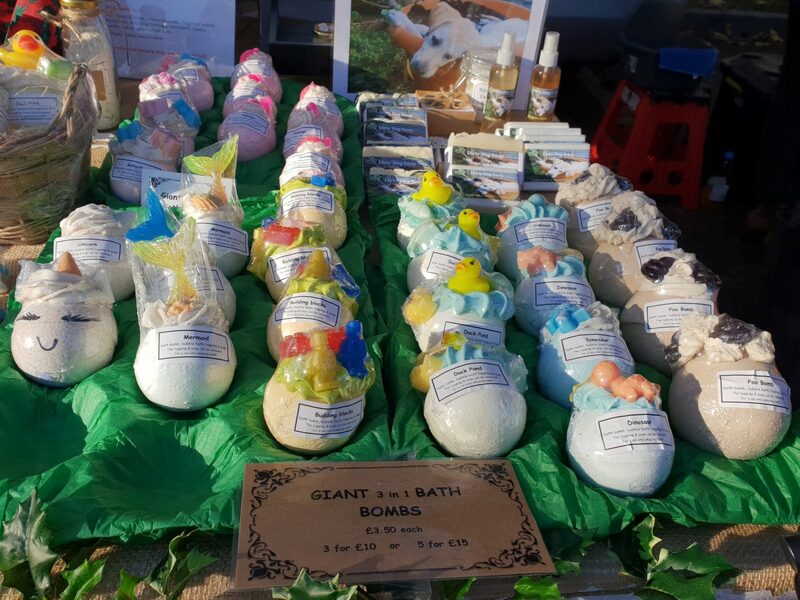 Lou Lou Bella sell hand made goodies for your bath and skin. 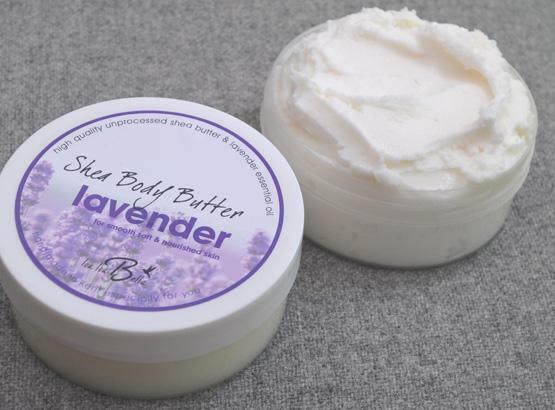 The body butters are good value and are made with nourishing avocado oil and shea butter. Meanwhile, a top seller is the foaming sugar scrub with coconut oil. To use it, you put some on and scrub, then add a little more water and scrub. Skin is left feeling rejuvenated and soft with a beautiful baby powder fragrance! These would be the perfect gift these winter to give your friends and families a treat for their skin. Mine is dry and cracking already and I’m sure I’m not the only one! As well as buying online, you can also purchase these lovely products at Christmas fairs. Keep an eye on the Twitter account to find out where to go! 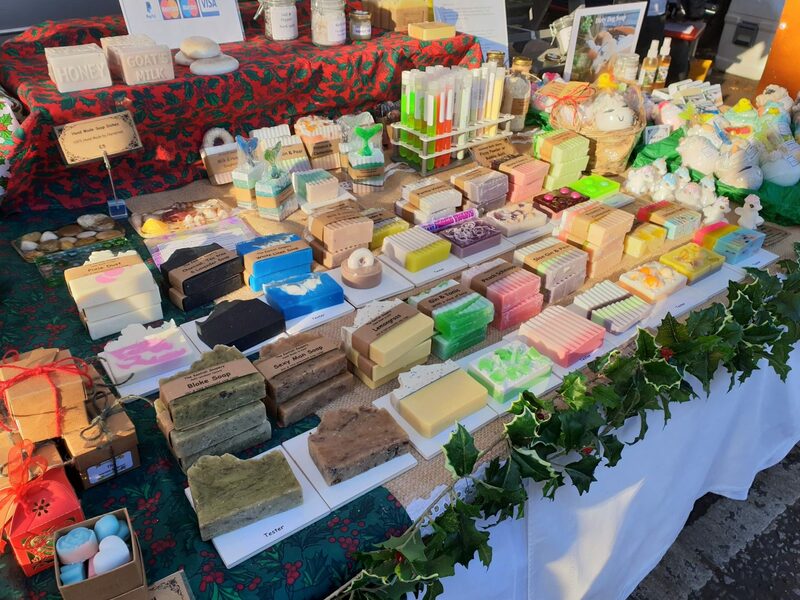 Based in Gillingham, The Kentish Soapery make the most divine soaps and bath bombs. When you smell them, you just want to buy all of them! A personal favourite has to be Monkey Farts though – there will be lots of giggles when unwrapping that one at Christmas! The bath bombs all have amazing designs. The top part of these is actually bubble bath and soap, so you can separate them from the bomb if you want to enjoy it across two baths! It’s hard to pick a favourite, but again my sense of humour was tickled when I saw the poo bomb. Fortunately, it smells of chocolate! The Kentish Soapery also have gorgeously presented gift hampers available. 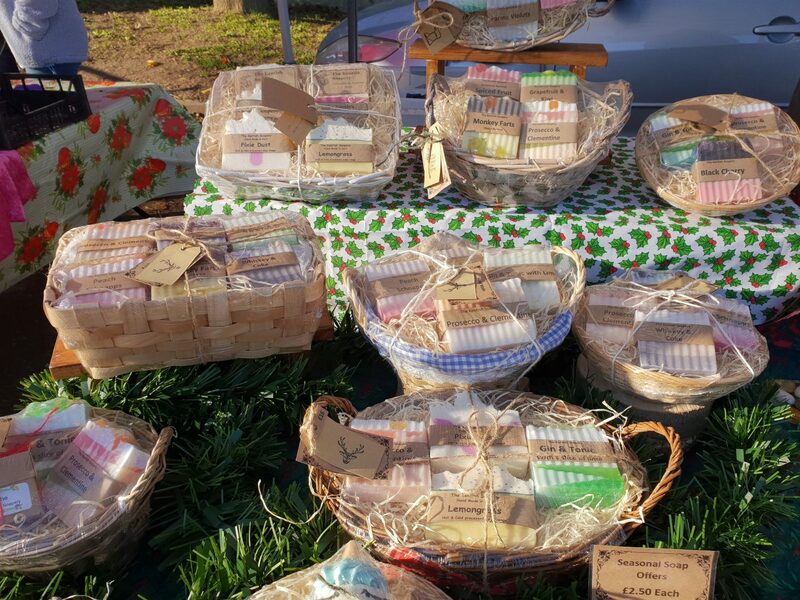 These cute baskets containing a selection of soaps would make a lovely gift! Once you’ve bought your gifts, see this recent post for tips and tricks on how to wrap them! Disclosure: This post is not affiliated with any of the aforementioned businesses. As always, all views are honest and my own.